This is another dish that I find there is so much similarity between the Vietnamese version and the Italian version besides Green beans with tomato. In Vietnamese, ‘ran’ means ‘fry’ and ‘trung’ means ‘egg’. In Italian, ‘frittata’ also means ‘fry’. First, I knew the Spanish tortillas version in 2004 when I lived on campus and a friend cooked that for me. It was however different though since the Spaniards use potato, which makes the dish heavier. With the Italian version or Vietnamese version, we can always use something lighter. One simple Italian dish is frittata with onion and parsley. 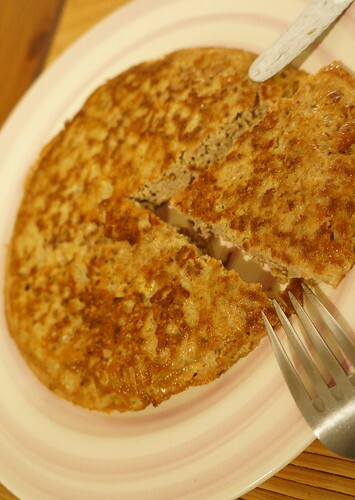 The Vietnamese has frittata using mugwort. I made this dish and as far as I remember my Spanish, Dutch friends around also like it, with the Vietnamese ingredients. However, I didn’t make it a lot before since it’s more difficult to make with ground meat included in. Now I know some tricks of the Italian cooking, I think I will make it more often. I find the the ways of cooking more suitable for me and make life a bit easier.